When people write loglines or a “premise test,” they often write one that misses the meat of the story. Stories aren’t just about the setup of an idea, it’s about the execution of that idea. That execution occurs in the second act. Here’s a simple trick to make sure you have a second act. 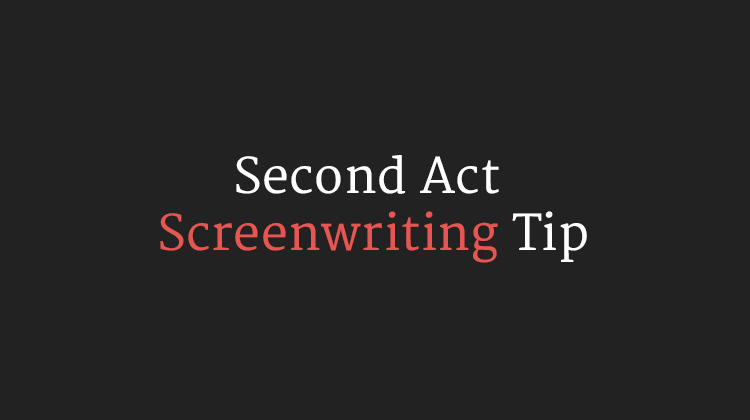 Next time you think of a premise, write a twenty word synopsis of one scene from the second act. That idea should be fun, entertaining, and something that could only occur given your setup and premise. It should be a scene you can’t wait to write. If you have an idea, but can’t think of a single idea for the second act, you should probably fine tune that idea before you spend 6 months struggling with a draft. As writers develop they begin to develop this skill subconsciously. A scene where two guys are talking in the office knowing they have a duel to the death coming up later that night? Seems pretty fraught, and it shouldn’t be too hard to make that scene entertaing and memorable. A meet cute outside a floral shop? Ugh, how am I going to make this special or distinct? That scenes been done to death. A slamming doors farce in Feydeau style? Fun, but really hard to write. That’s my taste, your mileage will probably vary. As writers we are storytellers and entertainers. When you have an idea, it’s useful to ask yourself if you can truly make that idea entertaining and worth the audience’s time.